1. Go to Media/Open Capture Device. 3. Under “video device name”, choose your webcam device. 4. Under “audio device name” choose your microphone. 5. Click “Advanced options.” Choose your aspect ratio, frame rate, Video standard and properties for your TV tuner if you have one. You can use the software that came with your webcam to control the input settings by choosing “Device properties.” Click Okay. 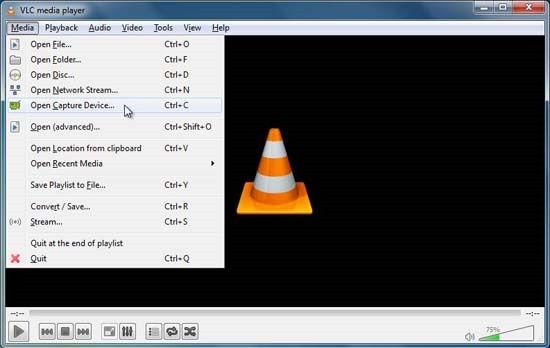 There are two options recording webcam video: You can choose “Play” which will play live video through VLC. You can record clips by clicking the red Record button. Or you can choose “Convert Save” and choose where to save it. Choosing Play and then recording clips in short bursts will require headphones because this method can create a feedback loop. Choosing “Convert Save” avoids feedback, but doesn’t let you see if a recording is being made or what’s being recorded. So press Stop when done. Lifeframe is not on my Asus G750JM. Also the Function key V does not produce a result. However I asked Cortana “”take a photo”” and it let me click on something called Camera, which filled the screen. And there I had the choice of snapping a photo or making a video. So I did not have to install anything. I did right-click on the Camera icon and said “”Pin to Taskbar”” so I could find it later. ?